I have not been told that they are being fixed, no SD or no tech ever mentioned this. All they tell me is that's a known issue. The solution may be available, but not being implemented to my knowledge. It may be a matter of 'when'. Several people on FT speak to the powers that be at AC and have relayed the fact that they have a fix which, last I read, was delayed due to fire testing or something. It does as you say appear to be taking a little too long but as I’ve posted I don’t personally feel AC is prioritizing it as much as they could - probably because they’re still filling J and occasionally giving out token coupons that force people to fly more AC. And some might comment on a new reluctance from SDs to provide the requisite form. Must be a new FA/SD on these planes then. I can’t believe anyone who flies regularly on the afflicted planes hasn’t seen it before. mamau and nexusCFX like this. When I write in they say without a form cannot do anything and am also SE. I am done and I don’t give up easily. Not because of the seats primarily but all this hassle and unpleasantness. I suspect they may be less willing to believe an undocumented claim because of how popular this thread is now. My first two issues did not receive a compensation form, but I had no trouble getting compensation. AmericanBovine had an issue once, but we explicitly asked for and received the form, and he received compensation. I'm glad my expensive tickets haven't had issues, or I suspect there would have been a much larger fight. I had a long conversation today. SD says they are told ONLY to hand out if cannot be (eventually) rectified. I feared something similar but still got the form after I woke up to a deflated seat. My back hurt because I fell asleep on what turned into a wooden/plastic bench for hours. Changing seats or adding a duvet before landing isn't going to help that. I told the SD that not only was the form justified, I knew AC wanted to track these occurrences because the seat manufacturer was reimbursing them for any issues. In late December my son's seat was deflated at the bottom and mine was deflated at the back/top. No form was needed--each was rectified before takeoff. Amazingly the fix held for the 13hr flight. BTW, (I didn't see this posted upthread), it seems like the manual power cut-off switch for the 777 middle seats are all along the K side aisle, and that each switch controls both seats. I don't call hearing or reading about this specific detail. Good to know. 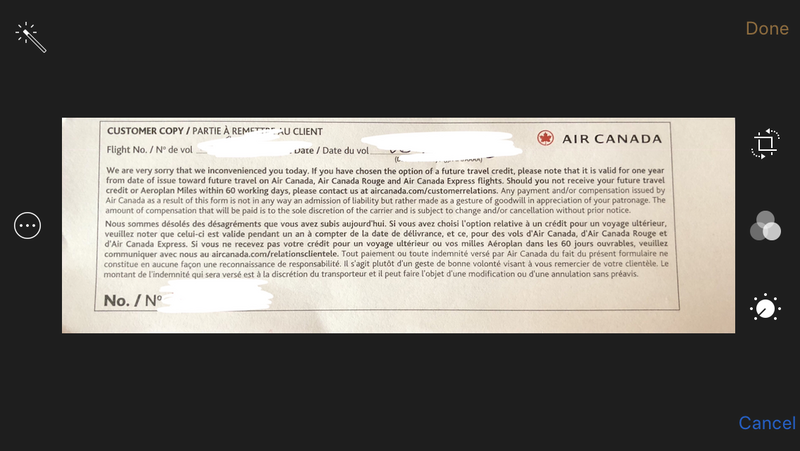 So, I had documentation - a card with a reference number rather than a form as they didn't have one on board, and this was the reply - no compensation. ""Thank you for writing to us about flight X. I'm very sorry to hear that you experienced a seat deflation issue again on this occasion. I can certainly understand your frustration with the seating issues you have encountered over the last year. We know our customers look forward to a comfortable and restful experience on long flights, and I would like to extend our sincere apologies for the consistent inconveniences you have experienced. I wish to assure you this is equally unacceptable to us, and the seat deflation issue is being looked into internally. 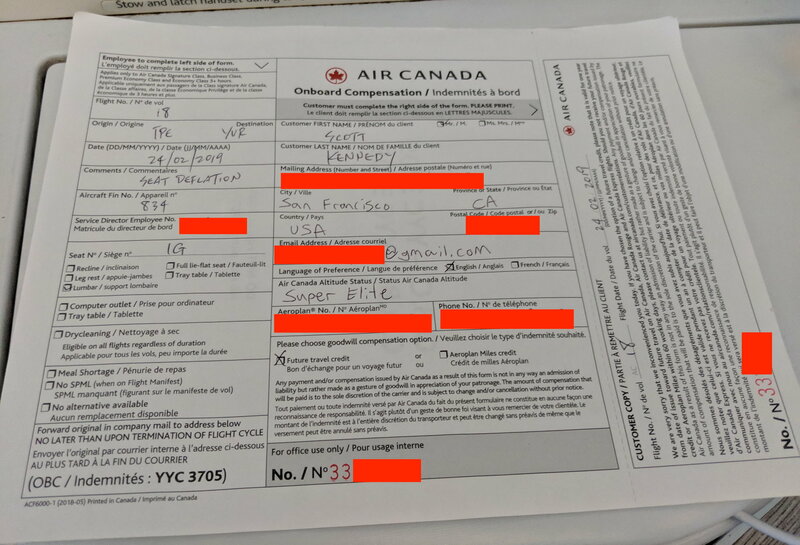 In addition, we have been in contact with our Inflight management team to request confirmation that the On Board Compensation forms are being loaded on all flights. They have advised that they will follow-up with their teams so we can ensure OBC forms are available in these instances. We have also requested further information about flight AC X specifically, and very much appreciate your continued patience and understanding while we look into this matter. I know this doesn't make your experiences any less frustrating, but I want to assure you we truly value your loyalty and support. We sincerely hope to be given the chance to serve you more favourably in the near future.""